Here's something you maybe didn't know about us--we're gadget geeks. I don't think we're gadget geeks for the sake of gathering gadgets only, however. Not every gadget is worth having, certainly, and many gadgets are redundant at best and downright wasteful (financially, economically, environmentally and polticially so) at worst. However, neither Alex or I have ever adhered to the idea that a simple life is devoid of technology or convenience. In fact the opposite is true for us. When we acquire a new gadget it's done with mindfulness. We think carefully about what impact the gadget will have and what it will inevitably replace, because the point for us is not to accumulate, it's to streamline and make our lives more productive, and well, simple. Not all the gadgets I'm talking about are computer or communication-based, either, lest you think that we're all about aquiring the machine that goes PING!. I walked around with a prehistoric cell phone from the year 2000 until two years ago, which makes my spiffy "new" one, well, not that new and it's looking rather well, ancient. It matters little to me, though, since I rarely use my cell phone anyway and it functions just fine. I mean, all I use it for is to call Alex from the playground in the city to let him know we can pick him up from work (Alex being a bus commuter). Often the gadgets that have been worth getting however have been things that make cooking and baking easier and more efficient, like the 14-cup food processor, the stick blender, the four crockpots, the 6-quart stand mixer, the coffee maker with timer and the electric can opener (arthritis). Alex and I cook. We often cook large quantities. We also process and can food (that self-sufficiency thing) and having the tools to make this work simple, efficient and easy are worth having. If ever we redesign our kitchen, we will plan space for storing these gadgets, and also put in that double wall oven and second dishwasher (cooking for a crowd thing, plus dishwashers are greener than hand-washing). That said, Alex is also an information technology guru--yes, we have magazines like Wired and Fast Company on the coffee table and our nine and eleven year old kids read them. We gave them Wii for Yule in 2007, being a non-video game home up to that point. Now the kids have Nintendo DS Lites. We value entertainment, especially during Maine's long winters (though I could easily justify these gadgets for their beneficial impact on learning). For several years now we've been unhappy with cable tv's offerings, but feeling like the few things we did like were worth the monthly bill. And our local video store just doesn't have anything to offer and it was always a drag going in there to try and figure out what to get. Other video stores just weren't convenient for us. The library's old videotapes (especially the stuffy film-strip quality "educational" types) just weren't cutting it anymore and we'd already seen everything they had on dvd. So finally I convinced Alex that we should try Netflix. See--we take our time. I realize how late to the Netflix bandwagon we are, so I'll spare you the newbie gush about just how great Netlflix is, as most likely you already know from personal experience. One thing that Alex is very keen to see happen (or make happen) is something he calls convergence. He describes this as having all the media that's available on the internet, combined with personal media on one screen, the idea being that all of it is where you want to be, like in the comfort of your livingroom, for instance. 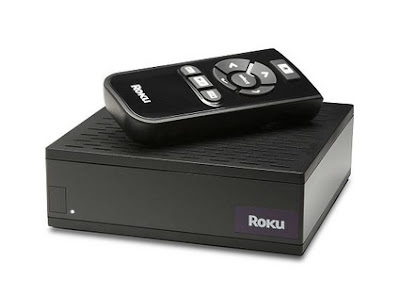 So when he saw that Netflix was offering something called a Netflix player by Roku, it looked like a must-have gadget, one that was getting good reviews and making gift guides. So naturally Alex ordered a Roku for us. With perfect timing it arrived during our Yule vacation so we had plenty of time to explore the joys of on-demand viewing. Here's where we've simplified--no driving anywhere, no late-fees, we're talking about cancelling cable once and for all, and I can already see the possibilities for unschooling as I have endless educational movies and documentaries available to us with a push of a button. All I have to do is put the film on Lewis and Clark in our instant queue and we can watch it. No inter-library loan, no buying plastic dvds, no renting. We had already laid a strong foundation in British humor for the kids, but now we walk around quoting the our favorite characters from Little Britain (Adam and Olivia already do a dead-on Andy--"I want that one! ", ah, it makes a mother proud). And finally, with years of waiting patiently, Alex now has all the Tom Baker Dr. Whos at the ready and the kids have even watched along with him--ah bonding with their daddy--and I know it made him happy to share his favorites with them. The other great thing about Roku is we don't have to sift through all the garbage on cable or wait until some twilight hour when a favorite show is scheduled. There are rumors that Netflix/Roku will team up with YouTube and Hulu like they have Amazon so we're watching treats like my niece and nephew skiing or Cake Or Death Legos on our very own tv in the near future. Until then, I'm perfectly happy getting The Office fix (British version, thank you) on our latest gadget. Maybe I'll fire up the popcorn maker and make some strawberry smoothies with the stick blender first. Ahhh, yes. My husband is a software engineer, so major (mindful) gadget geek. There are certain things we don't have yet (Wii or video games) but yesss, always interested in what is available and the technology that drives it. He got a new trail GPS as a gift from us this holiday, so that will keep him happy a few more months! The Netflix player sounds interesting. We tivo pretty much everything and he has a filter to extract commercials via our computer before it re-streams it to our tivo player so that we can have what we want ready to go. But having series of things unavailable on cable would be nice! I'm interested in learning more about the netflix player. We were just saying today that we're going to call the cable company and cancel it...I'll have to check out the website. Thanks for the info! So does the player basically allow you to play the "free" streaming Netflix content onto the TV rather than on a computer? Or is it different content? Sounds neat, but if we can connect the laptop to the TV is it the same? My word verification is "sconed"... Yummmm! Same here, I thought the Netflix player sounded interesting. I was telling my husband about it. We are loving Netflix, how great to just choose and play right on the television. Is just "watch now" movies or can you watch all the movies? I've been meaning to update this entry. Maybe it's worth a new post? I'm trying to collect info and rationale for what this is all about and why it is so cool!